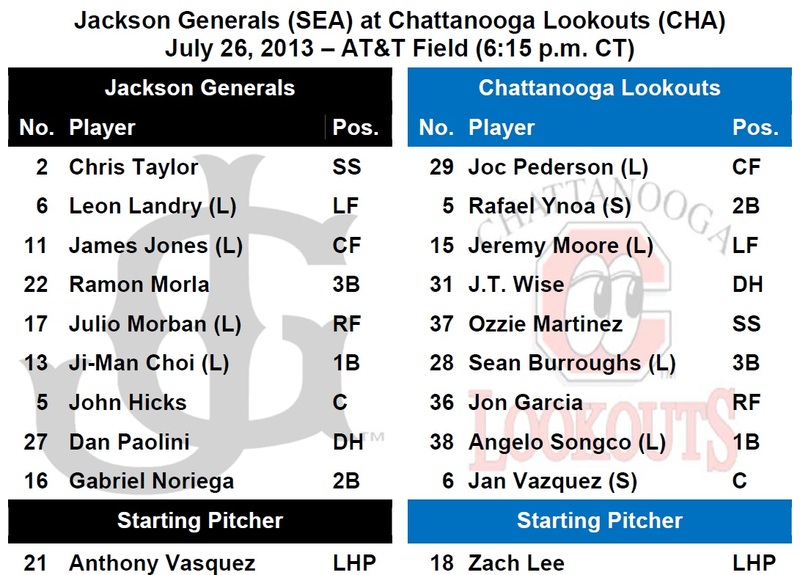 TODAY’S GAME: the Generals continue a 5-game road series tonight with game #4 at AT&T Field against the Chattanooga Lookouts…the Generals are 8-5 against the Lookouts this season and 6-2 at AT&T Field…26-year-old LHP Anthony Vasquez makes his 6th Jackson start of the season and 9th overall in game 4 of the series In 4 starts so far in July, Vasquez is 1-0, with a 1.44 ERA, holding opponents to a .181 average. GENERALS RECAP: The Generals won their third straight Thursday over the Chattanooga Lookouts 7-4, taking the series. Jackson’s offense produced 11 hits including 6 extra-base hits and a season-high 4 triples. LF Jack Marder paced the offense with 3 RBIs. The Generals have won 5 of 6 since the All-Star break and 7 of their last 8 road games.LH Anthony Fernandez won his team-leading 6th game on the mound. NEWS & NOTES: 37 of first 96 games have been 1-run games (15-22) which is the 5th in all of minors…52 of 96 games have been decided by 2-or-fewer runs (19-33) and 12 have been extra-inning games (4-8)…In games decided by 3+ runs the Generals are 25-18. • ALUMNI REPORT: 2B Nick Franklin was 1×4, R, HR, 3 RBI in Seattle’s 8-2 win over the Twins last night. He hit his 8th home run of the season in the 2nd inning (2nd at Safeco, 6 on the road). 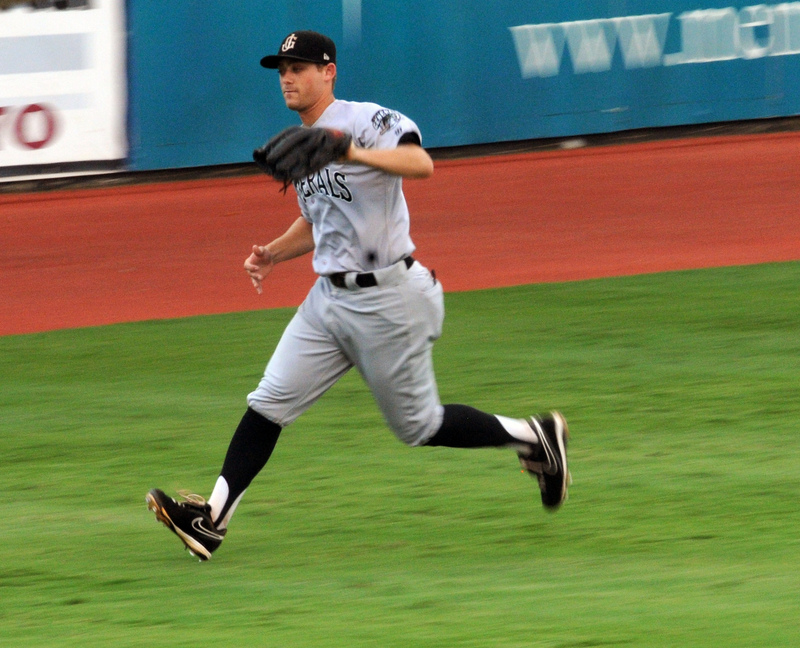 His 8 home runs are the most by an AL 2nd baseman in their first 49 games since Hall of Famer Joe Gordon (NYY) in 1938. • SEATTLE GENERALS:…there are currently (6) players on the Seattle Mariners active roster that were members of the 2012 Jackson Generals (INF Nick Franklin, INF Brad Miller C Jesus Sucre (15-day DL), C Mike Zunino and RHP Yoervis Medina, RHP Stephen Pryor (60-day DL). In total, (9) 2012 Generals have made their MLB debuts and (3) 2013 Generals. (C Brandon Bantz, RHP Hector Noesi, INF Brad Miller). • TRIPLES ADDING UP: OF James Jones recorded his league-leading 10th triple on Wednesday. He is one triple away from tying the franchise record. Jones is tied with Richard Lewis (10, ‘04) and Chris Walker (10, ‘06). Dwaine Bacon (11, ‘04) and Bo Porter (11. ‘98) are leaders. As a team the Generals have 29 triples which is 2nd-most in the Southern League. • SWEET HOME CHATTANOOGA: The Generals are 6-2 at AT&T Field this seasonand 25-11 since 2010 on the road in Chattanooga. • RAIN, RAIN GO AWAY: The Generals have been rained out 14 times this season and had 2 additional games suspended. The Generals have also had 5 games cancelled. Jackson leads the league having played 16 doubleheader games this season (7-9). • THE HOME STRETCH: The Generals are in the midst of playing 42 games in 42 days to close out the regular season. 27 of those games will come on the road and 15 will be at The Ballpark in Jackson. • WELCOME TO DOUBLE-A MR. LEONE: Generals reliever Dominic Leone is the 3rd member of the 2012 draft class to reach Double-A this season (Zunino, Taylor). The 21-year-old out of Clemson has tossed 4.0 hitless innings with 5 strikeouts in his first 3 Jackson outings, including his first save on Wednesday. • TAYLOR ADDING UP THE HITS: SS Chris Taylor recorded his 100th hit of the season on June 30 vs. Birmingham. He was the first Mariners farmhand to record at least 100 hits. Taylor is batting .316 (24×76) with 14 runs scored, 4 doubles, 2 triples, 1 home run, 7 RBI, 13 walks and 4 stolen base in last 19 games. • ALL ABOUT THE JI-MAN: Quietly, 1B Ji-Man Choi is having one of the best seasons in the Mariners farm system. Overall this season in A+ and AA he is batting .303 (91×300) with 14 home runs, 30 doubles and 59 RBI. He ranks 7th in AVG, 4th in HR’s and 4th in RBI in the organization. • WE GOTCHA! !…Jackson catchers lead the SL catching 54.2% of base stealers (52 CS, 96 Att). The next closest is Birmingham which is throwing out 36.0% of base runners. • BASEBALL AMERICA PROSPECTS: The Generals roster features 8 of the Mariners Top 30 prospects, according to Baseball America. Those include: RHP Carson Smith (16), OF Leon Landry (17), INF Jack Marder (20), C John Hicks (21), OF Julio Morban (23), INF Chris Taylor (28), INF Ramon Morla (29) and LHP Anthony Fernandez (30).